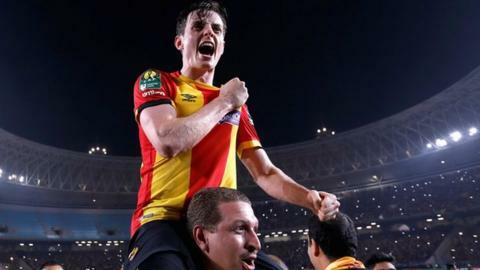 The thought of facing Real Madrid in this month’s Fifa Club World Cup might strike fear into some footballers – but not if your nickname is ‘Braveheart’, like Esperance’s half-Irish defender Ayman Ben Mohamed. On Saturday, the reigning African champions open their Club World Cup campaign against United Arab Emirates champions Al Ain. A win would put the Tunisians up against South American champions River Plate and should they cross that sizeable bridge, they could meet Luka Modric, Gareth Bale, Sergio Ramos and co in the 22 December final. “Hopefully we do come up against Real Madrid,” Ben Mohamed told BBC Sport Africa. “It’s a good challenge. We’re very excited about coming up against the top teams. Born in London, raised in Dublin and now based in Africa, Ben Mohamed’s football journey is an unusual one. While the left back may represent Tunisia at international level, he has not forgotten his roots in Ireland. “I wouldn’t say I’m 100% Tunisian,” he explains. “At the end of the day my mother is Irish and I was raised in Ireland – and I’m proud of that. Having grown up in very distant climes to those of North Africa, Ben Mohamed served a tough apprenticeship in the rugged conditions of the League of Ireland before moving to the Tunisian capital in 2016. Last month, he wrote his name into club folklore after helping overturn a 3-1 deficit against Egypt’s Al Ahly in the two-legged African Champions League final to dramatically win the title as 4-3 aggregate winners. “It’s an incredible feeling, to be a Champions League winner,” says a man whose childhood heroes included Steven Gerrard and former Chelsea and Ireland winger Damien Duff. His talent did not go unnoticed. In 2007-08, playing alongside older boys, the diminutive 12-year-old was part of a school under-14s team that won the regional Leinster Cup and made it to that year’s All-Ireland final. One of these included an exemplary attitude, with Mac Eoin remembering how Ben Mohamed improved so much during the season that he forced his way into the starting line-up for the final. “I distinctly remember talking to Ayman before the game,” the coach recalls. This spirit has earned him the nickname ‘Braveheart’ at Esperance, a comparison to Mel Gibson’s portrayal of Scottish freedom fighter William Wallace in the 1995 Oscar-winning film of the same name. Ben Mohamed was just 17 when he joined his first League of Ireland side, University College Dublin, before moving to Longford Town three years later and then on to 11-time champions Bohemians. Yet making it to the top tier of Irish football was far from plain sailing. “There were plenty of times when I was younger when I thought ‘this is probably not for me’,” explains a man whose quiet and thoughtful persona off the pitch belies his tenacity on it. “I was playing at one club and thought I was being mistreated – they put me in the second team and said I was too small. The approach, especially at youth level, is very wrong. They prefer a big player over a technically-gifted player. But it was Ben Mohamed’s mixed heritage that ended up paving the way for his pathway to Tunisia and, hence, the Club World Cup. “I was playing for Bohemians and studying in college at the same time – I had exams and was in the library trying to cram all my last-minute studying,” he says. His international call-up paved the way for the move to Esperance. The early part of his career with the club was also disrupted by cruciate ligament and groin injuries that required surgery. His journey from Irish semi-pro to African champion is still sinking in, but the next challenge is imminent. Only two African teams have ever reached the final – DR Congo’s TP Mazembe in 2010 and Raja Casablanca of Morocco in 2013 – but both lost. Esperance’s only previous appearance, in 2011, was less successful, losing their opening quarter-final to a Qatari side before being defeated by Mexico’s Monterrey in the play-off for fifth place. But Ben Mohamed is determined to see the tournament as an opportunity rather than something to be apprehensive about.